Of all the hotels we could have checked into in Chengdu, we had to find the one with the most grumpy, uncooperative staff possible. The woman at reception was slumped over the desk fast asleep. Lindsey shouted at her and she slowly awoke. She took our passports and went through the rigmarole of hotel bureaucracy, filling in forms in triplicate. Lindsey was insistent that we should see the room first, but in my grumpy, tired belligerence I disagreed. I just wanted to collapse on a bed. Besides, it was raining outside, didn't want to get soaking wet looking for another hotel. We were shown to the room. Adequate, but hot. The air conditioning doesn't work. I demand another room. Eventually we are shown one. The air conditioning doesn't work here either. My grumpiness increases, Lindsey was right, should've looked at the room first. She is getting annoyed now. Frustration. Show us another room. We wait. Eventually we are directed to a third room. The AC works, but it is a dingy room that is not worth the money. Still we'll take it. For the forth time I fill out a form that says I have no valuables to deposit in the safe and then we are asked for our passports and to complete yet another form. ' For the new room you see'. "Later" I growl at the woman and slam the door in her face. Fatigue is my master who will be obeyed. No petty bureaucracy will get in my way. Lindsey has already collapsed on the bed, she is fast asleep and within moments I join her in the land of the Zzzzzzzs. As I write we have been on the road for forty-six days. Today has been our first real day of rest. A day of doing nothing. Both of us are tired, and dare I say slightly fed up. 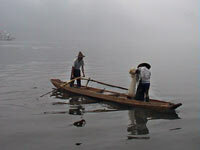 China fails to excite, there is little sense of adventure and we seem to be plodding from one major city to the next. Things will change as we move further south, but the immediate present is not that joyful. Impatience for a better tomorrow. And I thought we had left such emotions when we slammed our front door shut back home. (But some things seem to last. Like the Sunday newspaper that continued to be delivered despite my informing the woman in the corner shop to cancel it. Indefinitely). Chinese cities seem to lack character. They are all undergoing radical change. Old buildings everywhere are being demolished or awaiting demolition and new high-rise glass and concrete, granite and marble (and occasional bathroom tile facaded, although this is rarer with new buildings) monoliths are creeping up in their place. Modern china is looking up. It is far from the poverty stricken third world country I had imagined it would be. But then it is just the cities we are seeing. Surely this is just a masquerade. 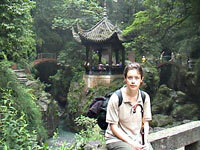 Not dreaming of the time in Chengdu where we felt miserable and sad. But as with all things, our current malaise is ephemeral. It will pass. The road lies ahead of us. We will enjoy. We make a start by leaving that hotel and check into Sam's Backpacker Guesthouse. Mmmmm, much better. We figured there were four reasons for stopping in Chengdu. 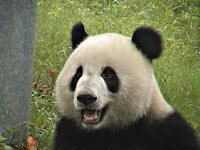 1. because it is on the route down south; 2. to see panda bears; 3. to see Emie Shan and Leshan; and 4. the food is renowned as amongst the best in China. You have to try Sichuan cooking, rants the guidebook. Emei Shan is one of China's holy Mountains. Lots of monasteries on the slopes and holy properties to the summit. It sounded like a good idea to trek up it. Apparently it is a strenuous activity, but can be done in a day. Just watch out for the monkeys. We made an early start, hitting the lower slopes of the mountain at 8am. Must leave in time to attempt the summit before dusk. We walk and then start climbing. Step after step after step. And it soon becomes clear this is going to be the theme of day. Steps. Lots of them. They are big steps as well, and before long our risible level of fitness is beginning to tell. But I am determined to do it. We will reach the summit. Lindsey meanwhile has other plans. She is whinging. And the whinge turns into a moan which blossoms into refusal to go any further. This is stupid. Let's go down and catch the bus up. She has really had enough and no matter how much pleading she is going no further. We've been an hour on the mountain and now she wants to go back. I am furious. We've not come half way around the world to take the bus etc etc. But my stubbornness often leads to greater hardship and maybe she is right. So grudgingly I concede and we are walking down the slopes, headed towards the bus stop. 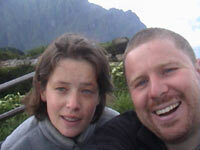 We get a bus up to just below the summit and walk the two hours, steep and uphill, to the top. The going is slow and the air thins as the altitude increases. The lungs have difficulty in sucking oxygen out of this naked air. What makes it worse is the old dears on pilgrimage who speed past us to the top. Women in their advanced years and they storm up leaving us feeling even worse. Finally the top. We'd wanted to stay at the monastery here, but we find a hotel first and decide to pass on the monastery. 380 Yuan, he wants for the room. "Discount?" I demand, doing the old walk away routine and shaking my head before we agree the price of 120 Yuan. Ten pounds. Still too expensive, but there is a TV in the room and the football is on and I figure the World Cup is more important than the authentic Chinese monastery experience. We spend the evening chilling out at the top of the mountain. It is surrounded by clouds and is very beautiful. I'd love to say peaceful as well, but the Chinese tourist groups were doing everything to prevent a peaceful perfect moment being enjoyed. Oh the Chinese tourist. But we'll leave him and his kind to another time. A monk approaches us. "Ay" he starts every sentence, "what country?" He has a face of peace, clearly he'd been here since long before the day-trippers started hitting this place in their droves. Pudgy cheeks and stretch marks around the eyes from too much smiling. I get up at 5.30 in the morning and venture to the summit again. Lindsey groans when I ask if she is going up with me, and rolls over. I am on my own on this one. There are already a large number of people on the summit- must've been on those tour busses since the tiny hours, coz our hotel is empty. Many of them are wearing bright blue, red and yellow overcoats that can be hired for ten Yuan up here. It is cold in the early morning. We are looking over the sea of clouds. Yonder east, awaiting sunrise. Now I have seen my fair share of sunrises. to name but a few, the Ganges, the Himalayas, Nemrut Dagi in Turkey, Massada, twice. And they are always a big disappointment. And Emei Shan is no different. In fact it is worse. It is cloudy and there is no sunrise. The ball of fire refuses to play game. She plays peek-a-boo and she's too good at this game. Nothing. Nada. Not a single ray. I spin round to the west and walk back to the hotel. Bed is calling. The walk down (back to the bus stop) is a brisk affair that is interrupted by the appearance of a couple of monkeys. Lindsey is petrified and I do little to be the stoic man. We wait for a large pack of Chinese tourists to appear and we hide ourselves in the midst of them. This was the right idea. A girl who tried to feed them was returned the favour by a scratch and a bite on the leg. If that was us it would've been the end of our holiday. A strict regiment of injections for the post-exposure rabies vaccination effectively prevents any major traveling. We catch the bus down and find our traveling companions to be unaccustomed to being thrown about on busses. A symphony of vomit ensues. It seems everyone is either puking into plastic bags or out of the windows. We endure the heat on the bus, closing the window. I have seen on Indian busses a passenger in the seat in front throwing up out of the window, only to have the vomit fly into the next open window and coat the passenger behind with a Technicolor coat of chunder. 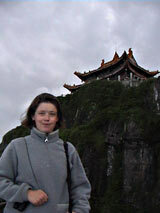 From Emei Shan we caught a bus to Leshan, home of the worlds biggest Buddha. And man is this thing big. Carved into the side of a cliff, he sits 71 metres tall, hands on his knees with his recently painted face gazing out over the river below. He was built to protect boats on the rapid waters beneath him. . Apparently the best way to see him is from a ferry, but on the day we chose to pay him a visit, the area was shrouded in a dense fog that limited visibility to a few metres. If we'd taken the ferry we'd have been deafened by the foghorn. An interesting story about the Buddha’s construction. A petty bureaucrat approached the monk who was overseeing it from the government who demanded a kickback before he would let construction commence. 'I'd rather gouge my eyes out than give you any money, you corrupt sod' says the monk and the bureaucrat calls his bluff, 'yeah right baldy. Now give me some baksheesh or the Buddha will remain in your dreams.' So the next day the monk knocks on the bureaucrat’s door and hands him a silver platter. With his eyeballs sitting on it. And in a state of shock the bureaucrat forgets all about the bribe. So we've seen the biggest Buddha in the world and now we want to return to Chengdu. 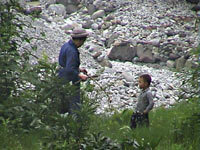 As we are leaving the site, a man accosts me, 'you take bus to Chengdu? You sit here!' Lindsey is convinced he is about to take us for a ride, rip us off, but I remind her this is not India,( not convinced myself that this man isn't about to con us). And we wait, and wait and grow impatient and then he shouts at us from the road and he has stopped the public bus for us and sometimes things in China are refreshingly quite unexpected. There are some fantastically helpful and friendly people here. The bus is a video bus, but this doesn't matter. We catch the end of First Blood and I repeat all of Sly's words, I know them off by heart because this was the first video I ever saw and we watched it over and over and over again. And next up comes Rambo, First Blood part 2, and even though it is all dubbed in Chinese you don't need to understand the language to know what is going on. 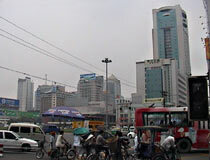 And as the final credits roll we hit the urban sprawl of Chengdu and crawl through the traffic into the bus station. As I mentioned earlier, the food in Sichuan is supposed to be excellent and Chengdu is the capital of Sichuan. 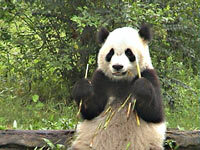 "Eating is one of the best reasons to prolong a stay in Chengdu" - The rough Guide. "Bunch of Arse" - Marc McNeill”. We stopped off in a canteen that came highly recommended and were presented with a smorgasbord of dishes. Nine or ten small bowls of 'stuff.' the tiny whole carp with little meat was recognisable, but that was about all. I rarely leave food, but we managed to leave most of these dishes. The taste, texture and smell of them all was, to our tastes (and I consider myself to be quite eclectic and open minded to what I eat), was foul. We found another restaurant and ordered a chicken dish. we did not expect to presented a dish of chickens’ feet. But then the Chinese do eat anything. The Cantonese in particular. We met a woman from Canton who told us of a proverb; Canton people will eat anything with four legs. except for the table and chair. Canton people will eat anything that flies. Except airplane. She also told us to avoid dragon and tiger soup. Dragon is snake, tiger is cat! We walked through a supermarket and amongst the sausages hanging in the meat department is the dried skin of a pigs face. We walk past a man gutting a snake, still alive on the pavement. And we hear stories of traditional restaurants that have tables with round holes in the middle and fires underneath. A caged monkey was placed under the flame and when it found the heat intolerable would pop its head through the hole in the table. to be decapitated with a sword and the blood from the brain to be drunk as a delicacy. I half thought we had found one such establishment, and was slightly worried when the gas was switched on below the table and a flame burned in the hole in the middle. But then a pan of stock was placed over it and this was hotpot and we were given slivers of meat and vegetable to cook ourselves in the boiling liquid. Not that the choice was extensive- pigs intestines, gizzard, frogs legs, stomach lining, etc etc. And so, much against my will, Lindsey managed to drag me into the great Satan of eating establishments, the golden arches. My body is a temple. Please forgive me oh body for polluting and desecrating you!